Backpacks are better. We finally ditched our suitcases in Lima... We literally left them on the side of the road with a “free” sign on them and never looked back. There are pros and cons to both, but I can’t imagine trying to get around these streets with a rolling suitcase, dragging it up 3 flights of narrow steps, or fitting them into a taxi. We are happy with our decision and got a pretty good deal on them at a mall in Lima. I am a bit more unorganized with a backpack rather than my suitcase though, if that is even possible. Never be distracted when crossing the street. I don’t know if pedestrians don’t have the right of way here or if no one cares but cars do not think twice about getting inches away from you and nearly plowing you over. It seems stoplights are optional and street lanes are more of a suggestion type-thing. You better put your running shoes on and get your head focused before stepping foot off that sidewalk! Food on the street is cheap and good. Why doesn’t St. Louis do this? It’s so convenient to walk outside and grab a quick, cheap, delicious lunch! What is feels like to be discriminated against. Yes I am female which gives me some disadvantages in life, but this is something more direct than anything I had ever experienced before. We are constantly getting ripped off and even when I know it is happening I try to retaliate but learning how to argue is not something I have practiced much in Spanish. Every time we get in a taxi I have to negotiate for the correct price. The problem is I still end up settling for more than it is supposed to cost in the pure interest of time, because everyone that drives by knows we are not from here and assumes we don’t know how much it should cost. I always agree on a price beforehand, but one time we were on a bus WITH THE COST POSTED ON THE DOOR- which was the price I agreed on before I entered- and then before we got off he tried to charge me double what he had just told me and what was posted on the door. Again I try to argue but I am not confident enough in my Spanish and I usually just end up giving up. Even the lady we stay with at Air Bnb severely overcharges us for our laundry. The markets don’t have prices posted, and every time we go to buy ice cream it’s a different price. In one restaurant each time we’ve been there they have refused to let us order drinks saying they are all out, but when we look around there are bottles in the fridge and other people around us have them. When I point this out to them they just shake their heads at me. Another restaurant charged us more than the cost of our meal for a glass of juice when our waiter had already told us juice was included in the breakfast price. Again, no menu, no posted prices, and our waiter was nowhere to be found. We spent 2 hours at the post office yesterday and afterwards I was ready to cry because of how unfairly we were treated. Long story short, it was very obvious we were singled out, and also made to pay more than anyone else. After the post office incident we both felt defeated and it was the first time we really sincerely felt like we were done, and wanted to go home. We were supposed to enjoy the rest of the day downtown but we came back to our Airbnb and watched a movie. It really drains your energy and spirit when you are made to feel less than everyone else. I'm sure this type of thing happened to us in other countries but it was by far the worst here. I realize I probably just sound like I’m whining, and this is what the minorities in the US have been trying to get us to realize for decades, but I am now able to understand better how awful it feels to be treated like you are dumb, or lesser than the next person. I'm so sorry to anyone who feels this way on a daily basis, especially those that are living among me in the US. You have to acclimate yourself. The altitude isn’t a freaking joke! If you come to Cusco you must give yourself about 4 days before doing much walking or running around. Have advil, water, and cocoa tea on hand! More Spanish! In Costa Rica most of the time I was with someone who could speak better than me, so they did most of the talking. In Panama most everyone spoke English. Here almost no one speaks English and I don’t have anyone with me that speaks it. I’ve picked up new words and phrases, and am learning not to be embarrassed if I mess up because it is all part of the learning process. Sports really do bring people together. Vince has played futbol everywhere we have gone. The past few times here I have gone and watched him. Seeing how these people are able to connect with him despite him not speaking any Spanish 1) astounds me 2) makes me incredibly happy. He always has a common ground to talk to someone about and always makes new friends after playing. It is a great, easy for us to get involved with the community here and meet new people. Different doesn't necessarily mean bad. We have been to many cultures, and a lot of things are different than they are at home. Behavior, food, what is socially acceptable, it all comes with a learning curve as you enter a new place and try to figure it out. 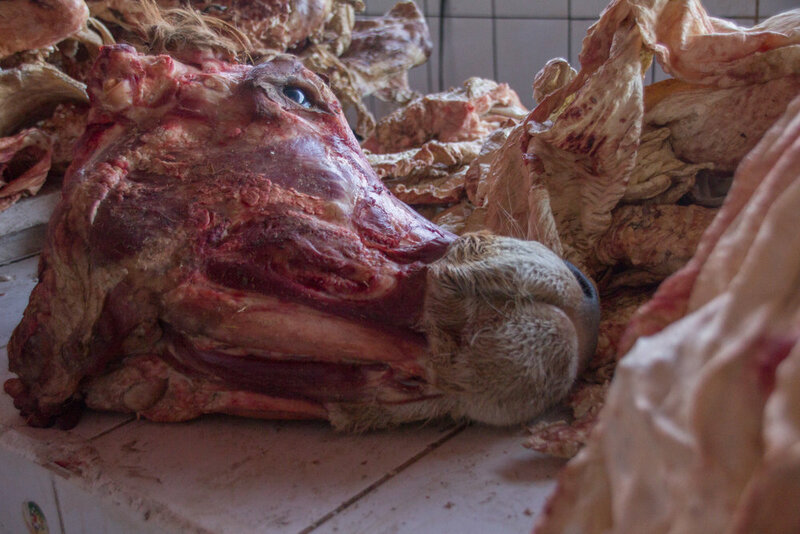 While some things really gross us out (like walking through a market of hanging meat) we do not show that on our faces, as that would be rude. We take it in and keep walking, smells and all.